Yaki straight clip on hair extensions resemble type 4 hair that has been chemically or heat straightened. Yaki straight hair has great movement and fluidity which means it’s not a stiff texture. If you get up close and personal, you'll notice very tiny kinks in the hair strands which is why it's doesn't appear as shiny as silky straight textured hair extensions. Blending your clip in hair extensions is a must for a convincing look. If you have naturally curly hair that you’ve had chemically straightened for some time (as in not salon-fresh) or curly hair that’s been heat straightened, you’ll be able to blend it with your clip in hair extensions. The more texture (curly) your natural growth hair was before straightening, the more likely it is that it will blend with Yaki straight (relaxed straight) clip hair extensions. This means that straight and wavy heads may find their natural hair is glossier than Yaki straight hair and so won’t blend as well – there’s not much that can be done about this as the ability for hair to reflect light (and therefore look shiny) is due to the overall shape of the hair strand itself. So if you have straight or wavy growth hair then the better texture options for clip in hair extensions are silky straight or natural straight textures. Yaki straight clip hair extensions are available as single wefts. Wefts can be as narrow as 1 inch and these are frequently worn at the sides of the head near the temples. Wefts can be as wide as 9 inches and these are typically used at the back of the head (ear to ear). Yaki straight clip in hair extensions are also available in multi width sets (multi what whoa!? Read on and all will be explained). Densities… Wefts also come in different weights (densities). The larger clips are frequently available in different (weights) densities so you have the choice of buying a single 9” piece that weighs 100g or 9” piece that weighs about 40g and you can check out images of this here. If you’re clip in hair extension mavens we think you are (or if you’re new to the game and have read any of our other articles on clip in hair extension textures), you’ll know that Yaki straight clip hair extensions are available in lengths the short eight inches to the long 28 inches. Being a maven, you’ll be aware that longer lengths are on the market but you’ll have to work like a treasure hunter to find them. 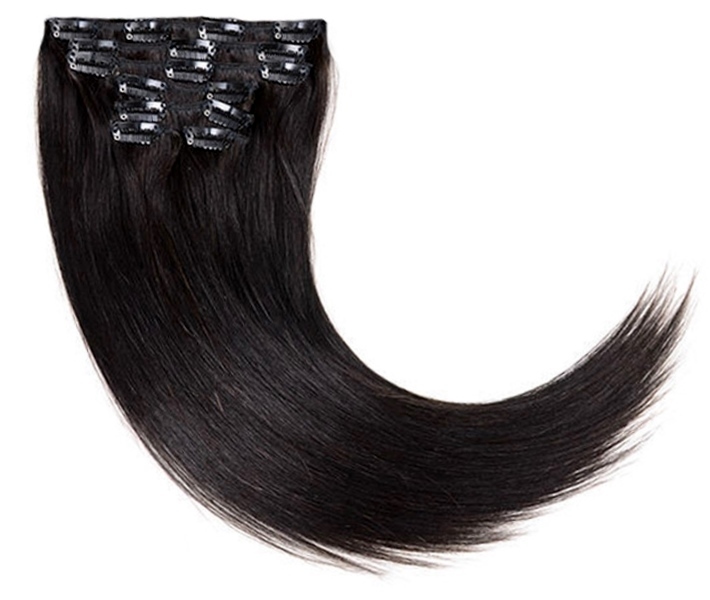 Yaki straight clip hair extensions are available as unprocessed hair (aka “virgin” hair), remy and non-remy versions. Everything….no joke. Yaki clip in hair extensions are available in jet black, ombre, browns, lowlights, pastels, T-colours, caramel blondes, greens, dip-dyes, auburn, honey blondes, coppers platinum blonde, burgundy, blues, if you can spell it, the makers can dye it. 1. Use a leave-in conditioner or deep condition your clip in hair extensions to repair and strengthen the hair as it has been chemically processed. 2. Wash your clip hair extensions with a shampoo designed for chemically treated hair. 3. Prevent the hair dehydrating by using a moisturizer without mineral oils. 4. Seal in more moisture by applying hair oils to damp hair. Yaki straight clip in hair extensions good to go! If you’d like more tips about clip in hair extensions check the Hair Extensions Q&A section and if you’d like to keep up with the next guide about clip hair extensions, wigs, weave hair, hairpieces and wigs then join our blog.